Determined to give our boys an authentic Fijian experience without the crowds and international resorts, we had the pleasure of spending nine days at Savusavu, a town on the south coast of Vanua Levu island, Fiji’s second largest but less frequented island. Known as the ‘hidden paradise of Fiji' and with a population of less than 5000, Savusavu’s village-like charm, vibrant culture, natural beauty, warm people and laidback way of life won over our whole family. US Motivational speaker and author Tony Robbins owns Namale Resort at Savusavu but there are no international hotel chains, upmarket boutique shopping and kitsch tourist attractions here. Instead, expect pristine rainforest which meets the ocean, world-class snorkeling, diving, fishing and self-sufficient villages filled with locals boasting an unrivalled generosity of spirit. We stayed at family-owned boutique resort called Koro Sun, a sprawling 150-acre former working copra plantation with virgin rainforest on one side and the aquamarine waters of the Koro Sea on the other. Owned by the hands-on Young family for the past 15 years, Koro Sun has a village-like atmosphere and offers a range of accommodation from original Fijian garden bures to over-the-water villas, and their famous adults-only Edgewater Bures. The US-based owners foster a strong sense of community with the surrounding villages and were instrumental in helping rebuild villages after Tropical Cyclone Winston, which devastated the area in 2016. Koro Sun is the perfect mix of rustic, authentic charm and understated luxury and is very family-friendly. When we left, the staff gave our boys a coconut tree with their names on it and helped them plant them on the grounds. We actually shed tears when the staff sang us a song as we left to go to the airport. My husband and I have travelled a lot of this wonderful world and I’ve never cried when I’ve left a place before. Just saying..
One of the highlights of our stay was a visit to the local primary school in the seaside village of Nagigi, population 150. The children asked us questions and sang songs and were full of life and warmth despite many of them having left their remote villages in the early hours of the morning to make it to school on time. We’d heard the school was in desperate need of stationary and pencils so we were happy to hand over a bag of supplies we’d bought over as well as a rugby ball, which was soon thrown around the playground by the rugby-mad students. The school also boasts panoramic views of the reef and palm tree-lined coast. There are plenty of organised snorkeling trips but we decided to check out the pristine reef in front of Koro Sun ourselves. We piled into a three-man kayak, and passed smiling locals hand line fishing for their lunch on our way out to the reef. We tied the kayak to a big rock while we explored the reef below; our big boy Sunny shrieking with joy every time he saw a brilliant blue starfish, a colourful fish or a piece of coral. Koro Sun organised a trip to Vuadomo village with locals Solo and Romano. They instructed us to take off our sunglasses and hats and nominated a fellow visitor to hand over a gift of kava root they’d bought as an offering in return for a visit to the local waterfall. The tiny, self-sufficient village was peppered with multihued bures and the locals laughed as our sons chased chickens around the gardens and marveled at a bamboo raft, which was used for nightly fishing trips. The 10-minute walk to the waterfall was just as scenic as the falls themselves. Along the way, Solo pointed out the kava plants, passionfruit vines, wild chilies and ginger all around us. 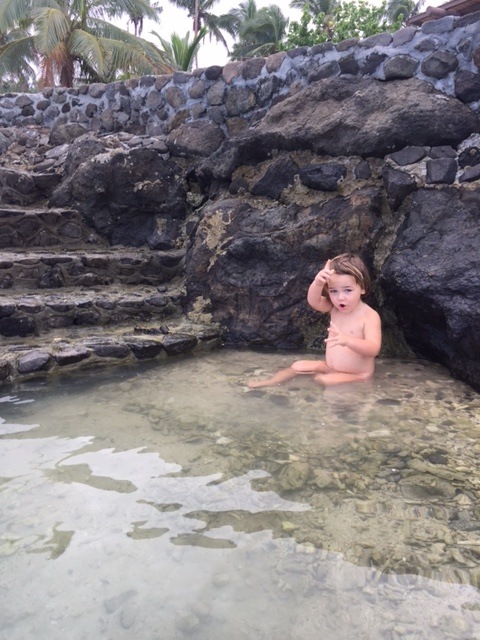 A swim in the cascading waterfall and rock pools was the perfect end to our morning. For fresh fruit and produce, the Savusavu farmer’s market is a hive of activity, especially on Saturdays, the main market day. We loved the myriad of vibrant stalls and chatting to the locals selling everything from organic fruit and vegetables to coconut oil, fish and spices and arts and craft. Lets face it, kayaking with kids can go either way but my boys loved this experience. The guides followed the incoming tides so paddling upriver was easy and the funny locals had plenty of interesting stories to share about legends of the area. The salt lake, the island’s largest, is so tranquil; Ziggy actually fell asleep and started snoring in my lap so there was no swimming for me but my husband enjoyed diving from his kayak into the inviting water. One of the highlights of our stay in Savusavu was meeting affable local Jope on a fishing trip. Having boys the same age, Jope invited us to his home for a play date the following day. He picked us up and drove us to his scenic village nearby where they welcomed us into their family home. Jope offered kava and his wife cooked for us as we watched as our boys play together. The kids couldn’t understand each other but they bonded over a game of rugby, chasing chickens and sharing food. If you can get a cheeky hour away from the kids, a trip to Koro Sun’s Rainforest Spa is an absolute must. Opt for their signature banana leaf body wrap and zone out while a cascading waterfall and native birds provide the background music – bliss!! The dining in Savusavu was a surprise. Unlike many other resorts in Fiji, Koro Sun isn’t only all-inclusive so you’re not committed to eat every meal at the resort. We enjoyed Koro Sun’s delicious traditional lovo feast, where an array of meats and homegrown vegetables are placed into an earth oven, lined with palms and hot coals and cooked for several hours. We also ate lunch a few times at popular little local’s Indian curry house called Country Kitchen across the road from the town marketplace. It was inexpensive and the curries, roti and dhal were authentic and tasty. Despite the dubious name and dilapidated entrance, one of our most memorable meals was at Surf’n’Turf in Savusavu town. It might be the town’s ‘fine dining’ restaurant but there’s definitely no need to dress up, and the big timber deck overlooking the water is great for families. The mud crab curry was one of the best I’ve ever eaten, and the kingfish sashimi was fresh and delicious. Like many places in town, they are on ‘Fiji time’ here so if you’re patient enough to stick around for desert, the homemade coconut ice cream is well worth the wait. Tips: The best time to visit Savusavu is during the Australian winter months of June, July and August.